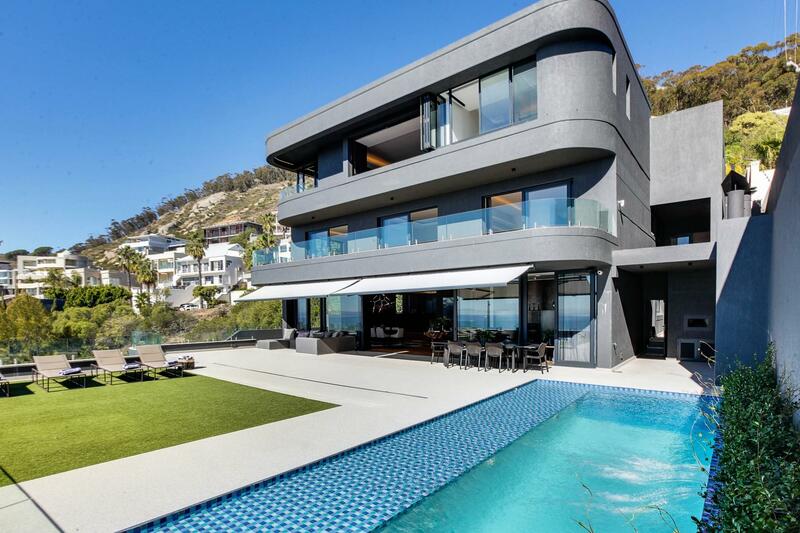 Superbly located on the seaside of the road, this dramatic contemporary home built over three levels, offers a sophisticated yet relaxed lifestyle, perfect for entertaining and family living. Generous inter-leading living spaces with floor to ceiling doors, and filled with natural light, allowing for breath-taking sea and mountain views. An exceptional home for the discerning buyer, with high quality luxurious finishes throughout, this residence is in a league of its own. The upper level comprises entirely of an exceptional master-suite featuring wall to wall lush carpeting, bespoke furniture, creating your own private sanctuary and offering tranquillity and privacy. Floor to ceiling windows and doors, maximize the 360 degree panorama encapsulating the ocean, Robben island, and the Atlantic Ocean. Exquisitely finished, with meticulous attention to detail, all bedrooms are luxuriously en-suite, and spill out to wrap around terraces, inviting the outdoors indoors, filling the home with natural light. Marvel at the seamless flow from fully integrated open-plan kitchen to linked ultra-spacious living rooms, and cinema room, with bespoke furniture throughout, to semi-covered outdoor expansive terrace, level garden and pool, lending a sense of space and serenity to this immaculate home, creating an ambience that guests feel at ease in, and providing the flexibility to entertain guests all year round. Other features, too numerous to mention, include a luxurious separate self-contained guest suite with its own private entrance and terrace, and spectacular views. This home epitomises the ultimate in simplicity and elegance.